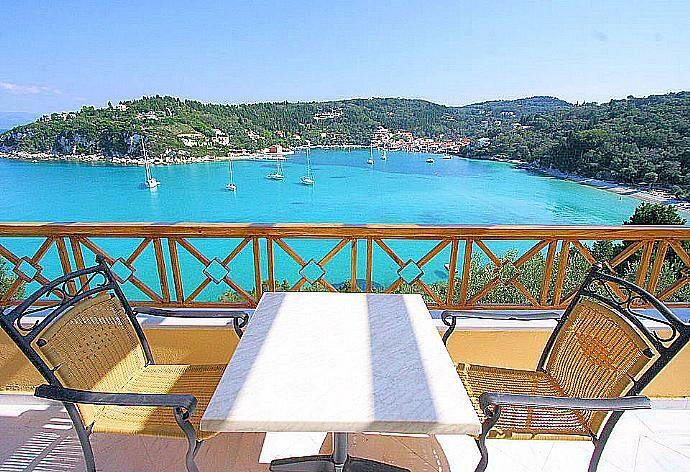 Katerina is located in Faros (Lakka) on the Greek island of Paxos. This vacation rental property is air-conditioned and sleeps up to 6 people with 3 bedrooms, 2 bathrooms . The property is walking distance to the beach and restaurants. Two bedrooms on ground floor (1 double, 1 twin) sharing a bath/shower room, one bedroom (master double) on first floor with en suite bathroom (bath with shower). Large living/dining room (with sofa bed sleeping 2), opening into kitchen area. Extensive balconies with views. The living room has sofas, Satellite TV and DVD player. There are sea views from the living room. Katerina can sleep up to 6 people. 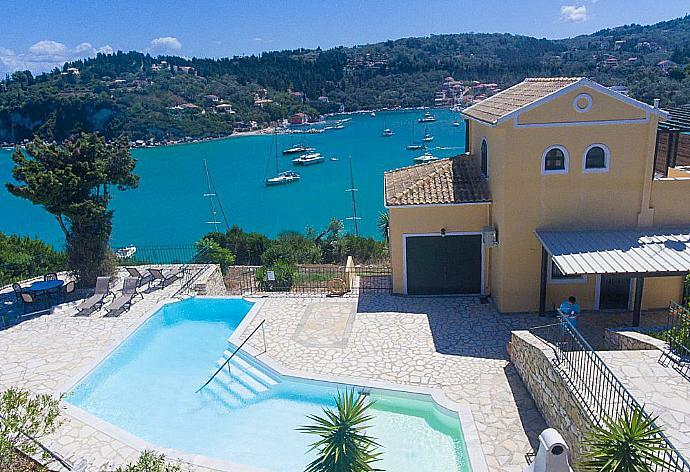 Paxos is the perfect Greek Island retreat and Villa Katerina has one of the most stunning views! My 4th stay at Katerina. Says it all. Villa was in a good location, large enough for a family of five or six. View over Lakka bay was beautiful but you need to be fit in order to walk up and down from the town. Loved the situation and would definitely recommend and book again. We adored our time at Villa Katerina. It was perfect!! The view from Villa Katerina is amazing really beautiful and all rooms benefit from this vista. The property whilst being simply furnished and fitted is comfortable the bedrooms are spacious and the beds comfortable. The walk to the local beaches and into Lakka requires a small level of fitness as it is by a steep and somewhat rocky path. However the 10 minute walk into town each morning for the bakers or breakfast had lovely sea views and was very doable it was one of the highlights of our holiday. There are many good restaurants in Lakka and it has a nice friendly vibe. It was our favourite place on Paxos. As Villa Katerina does not have a pool we also enjoyed trips to Monodendri beach to the bar with a beautiful pool. The beach here was also good for snorkeling. 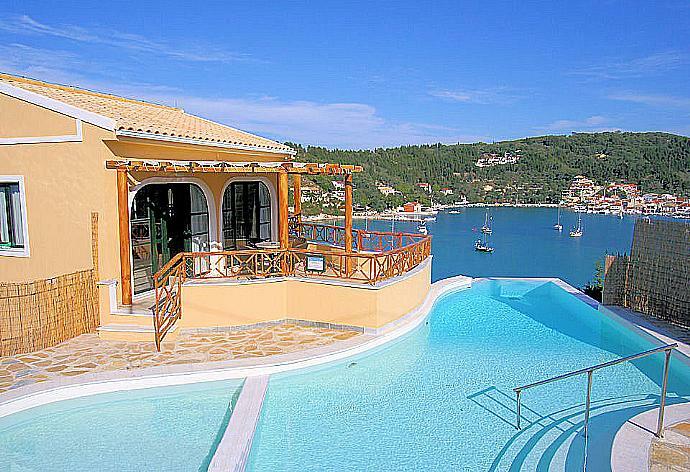 Comfortable spacious villa with stunning view from the balconies. Walked to 5 different beaches and still thought the swimming was best from the one 3 minutes away where we had delicious mezzo lunches. Made us wonder why we had left a 30 year gap before coming back to Paxos but so relieved that it is as lovely as ever. Will be back next year. Thank you Agni Travel for excellent service and support. Fantastic. Dream location. Views amazing. Paxos is a gem. We love it! Lanka is a superb place. We would definitely use Agni travel again. The island and its people are beautiful. It was a magical place to stay. The beaches themselves are beautiful and a visit to Anti Paxos a must do. The water in the bay in Lakka is very clean and the bay is beautiful. The food on the island was all good. Very good location for the villa and comfortable beds. This is the second time on Paxos and I would go again. We thoroughly enjoyed our stay in the villa and would visit again. The villas were by far the most outstanding that we viewed in Lakka and the views from the balconies were absolutely fantastic even on the few rainy days that we experienced for that time of year. 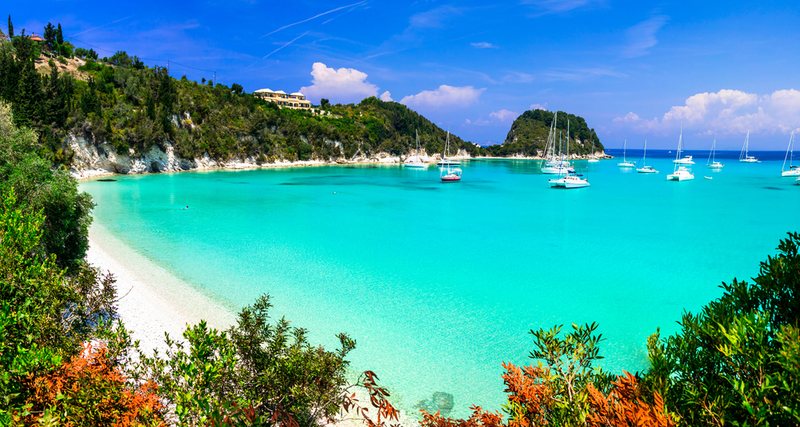 Paxos is a secret little hide-away. Agni Travel provided an excellent service. The property was excellent. It was modern spacious and the views were splendid. Although we did not have a car we managed to get into Lakka fairly easily via the path to the beach or along the road. The house was very well equipped. Lakka itself is lovely with a good choice of tavernas and places to buy provisions. We had a great and relaxing week which is exactly what we wanted. Paxos itself our regular favourite holiday destination since 2004. Katerina was booked 4 days ago!